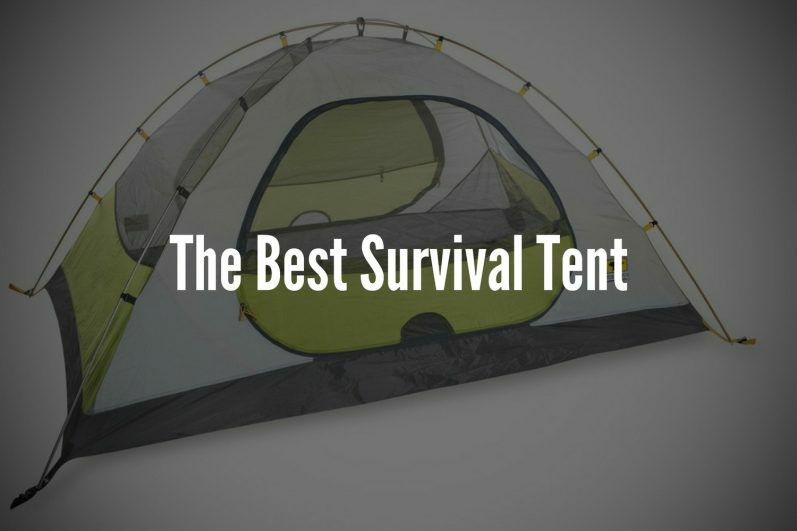 In the market for the best survival tent? Do you know what to look for a camping survival tent? Generally, people look out for tents that are of high quality, highly durable, spacious, and versatile because tents with these features will be great for survival situations. More importantly, you should also make sure that your choice of tent is easy to set up and quality and durable enough to withstand bad weather and high force winds, just in case you endure one while you are camping. Survival tents should also be lightweight, flexible, and must be easy to pack so that they will not be a handful and they can be conveniently stored away after your weekend or holiday get-away. Furthermore, your survival tents must also provide protection from mosquitoes and other insects that might bug you at night while you are in deep slumber. 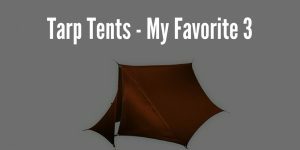 There are many different kinds of tents in the market today so you have plenty of options to choose from. There are canvas tents, stout tent, 1, 2, 3, 4-person, and family tents available. However, you should not just pick and purchase one without doing your assignment. Know that bagging on automatic pop up options, spacious floor area and easy to set up features is sure to make your tent shopping worthwhile. More importantly, you have to make sure that you are getting the tent that perfectly fits your needs, preference, and budget. This automatic and instant setup tent by Survival Hax is a light weight tent that is suitable for 2 to 4 persons. It includes a portable pack that can be used for hiking and camping. 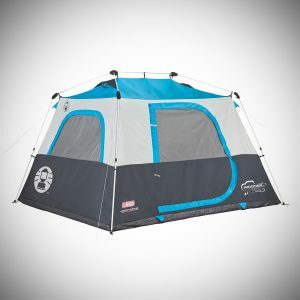 This tent can also be easily carried on backpacking trips and hiking due to its ultra light design. Moreover, it is highly durable and is made with Oxford material and hence suitable for all the seasons. It can comfortably allow two adults and two kids to take shelter in it. In case only adults will be using it, then it can fit up to three adults. You can have great view from this Pop Up tent as it has two openings that will enable you to enjoy all of your views. Due to the openings on both the sides, you will have good ventilation too. This tent is also a great option if you are looking out for a tent that can be pitched easily as it has Automatic Pop Up option which enables you to pitch this tent without much difficulty. You need to just throw it in the air to open it and the tent is immediately ready for use. Amazing, isn’t it? If you are looking out for a large tent that can shelter six people, then CORE 6 Person Instant Cabin Tent by CORE Equipment the best option for you. This is one of the fantastic tents available in the market under the 6 person tent category. The tent is large enough to fit two queen air mattresses and it has an amazing centre height. It also has CORE H20 Block Technology and ground vent that is easily adjustable thus making it strong and easy to use. The other features of the CORE 6 person tent include: a lantern hook for using lanterns, a gear loft, and a large wall organizer for keeping your items and belongings safely and neatly away from the floor. Another attractive feature includes Electrical cord access port that is fully closable when not in use; a rain fly that protects you from rain, tent stakes and an attractive carry bag. The shipped packaging indicates all the contents in the package and it’s highly reliable. This attractive spacious tent is designed for 6 people and can fit 2 queen air mattresses. It can cover a 10 x 9 ft. floor area, and has 6 ft. 2 in. center height. Its pre-assembled poles allow you to easily set it up anywhere and anytime in just a minute. This fantastic tent also comes with a 1 year limited warranty. In addition, the built-in vented rain fly feature of this awesome instant cabin gives extra protection from varied weather conditions. It works great when it comes to keeping water at bay as it has welded floors patented by WeatherTec™ system and has inverted seams. If you are looking out for the best survival camping gear that gives value for your money, then this is a great option for you. Wait, there’s more. The Illumiline™ reflective guy lines feature of this instant cabin make it highly visible at night. 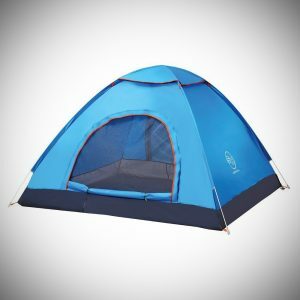 If you are single, adventurous, and all you want is a tent for yourself then this Alps Mountaineering Lynx 1 Tent 2015 from ALPS Mountaineering fits your bill. You will be satisfied with its durability as it is made with polyester taffeta. While the polyester fly resists Ultra Violet damage and stays firm, free standing, two pole design w/7000 Series aluminum poles enable easy assembly with the help of pole clips. This tent can also give extra protection from all weather conditions with its built-in floor seams and factory sealed fly. The base size of this 1 person survival gear tent is 7’6” x 2’8” with Center Height of 3′. The Poly taffeta floor w/2000mm coating; and extra-large #8 zippers is an extra feature. The tent offers vestibule for gear storage and weather proof fly buckles for extra protection during varied weather conditions. You will have good ventilation with its half mesh walls. Other attractive features of this tent include mesh storage pockets, aluminium stakes, guy ropes, and gear loft. 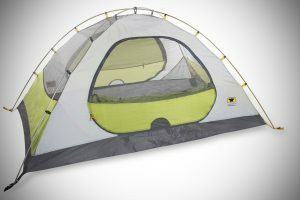 It is also lightweight at only 3 pounds 15 ounces with around 20 Sq ft tent area. For 30 years now, Outdoor outfitter Mountainsmith has been creating rugged and versatile tents for every camping enthusiast. 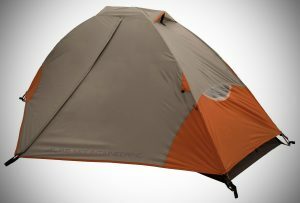 This 2 Person 3 Season tent is just one of Mountainsmith’s creations. 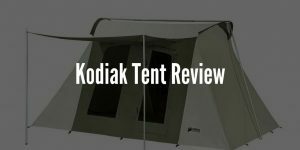 It became popular when it got the “Killer Deal” and “Killer Value” award in the Backpacker Gear Guide 2011 because of its many amazing features that is sure to make your camping experience more fun, comfortable, and convenient. First off, as its name implies, this tent is suitable for 2 persons and 3 seasons. It also has these great features to boasts: a polyester floor along with 5,000-millimeter-rated polyurethane coating, 30-denier nylon storage sack, breathable polyester tent material, polyester rain fly and 2,000 mm polyurethane coating. Moreover, the beautiful bathtub floor with taped seams keeps this tent always dry. The two pole design with color coded fly attachment system and the printed instructions on stuff sack help you in fixing the tent effortlessly. It is very spacious with 35 sq. ft. for its main floor space and fourteen sq. ft. of vestibule space. It measures 56 by 43 by 92 inches (W x H x D) when set up and 7.5 by 18 inches (W x D) packed and weighs four pounds 11-ounce. All these and more have made this survival tent from Mountainsmith deserving of its “Killer Deal” and “Killer Value” title. 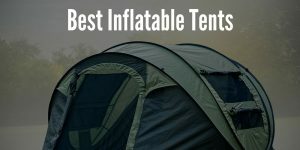 To sum it all up, the Mountainsmith Morrison 2-Person 3-Season tent is the best option on this list. Fortunately, I own one and it’s one of my favorite pieces of camping survival gear. 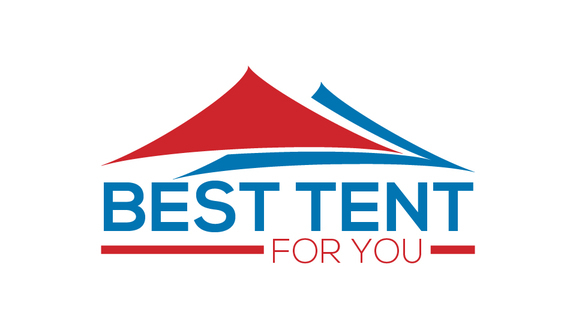 With this tent, you are really investing in something great. 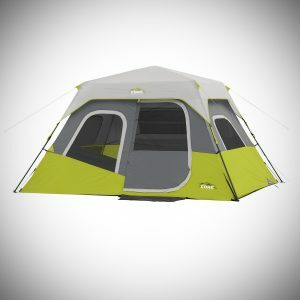 You will really get what you pay for if you choose and purchase this awesome tent from Mountainsmith. All the other options in this list are also great choices so feel free to choose the one that fits your needs, preference, and budget best.